Yes, we may all wish for sprawling abodes. 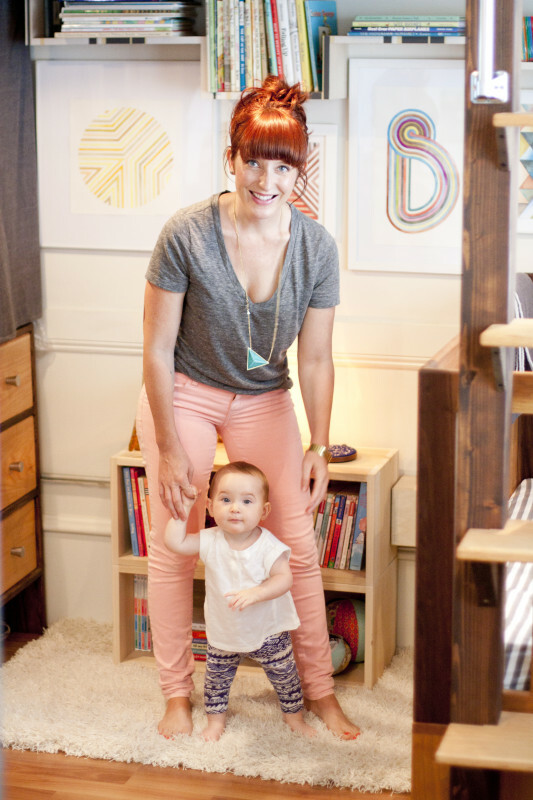 But the 35-square-foot bedroom/nursery that San Francisco residents Erin Feher and Danny Montoya share with their beautiful baby girl, Orion, actually has us dreaming of tiny spaces to share with our tiny humans. How much warmth and personality can you pack into a mere 7×5 foot room? 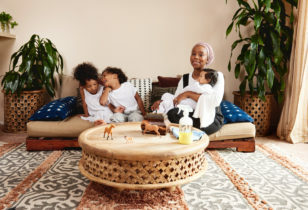 More than we ever thought possible, thanks to the seasoned hands (and downright precious offspring) of the former California Home + Design editor-in-chief (and current S.F. editor at Red Tricycle) and Key & Kite craftsman. Here, the industry pros invite us into their shared family bedroom, built from the ground up. 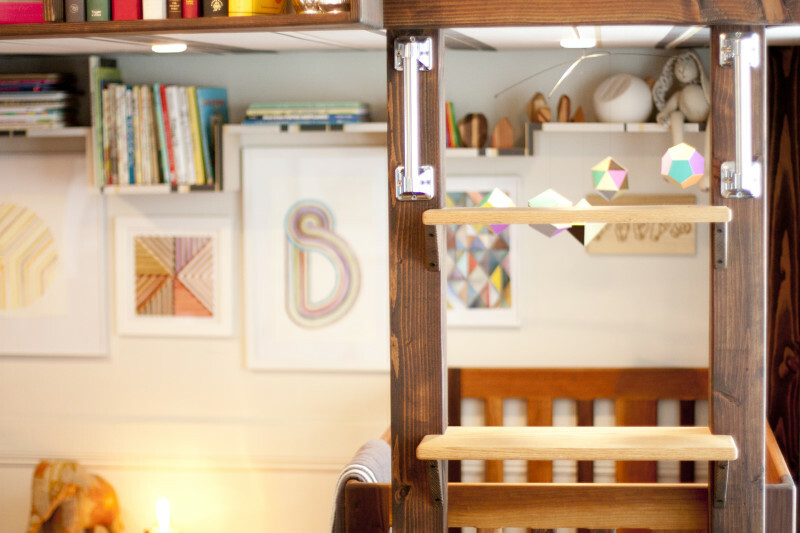 With a handmade loft, dresser, closet, crib, and bookshelves, plus artwork and decor created by loved ones, their casa is a shining example of how small spaces can inspire massive creativity. 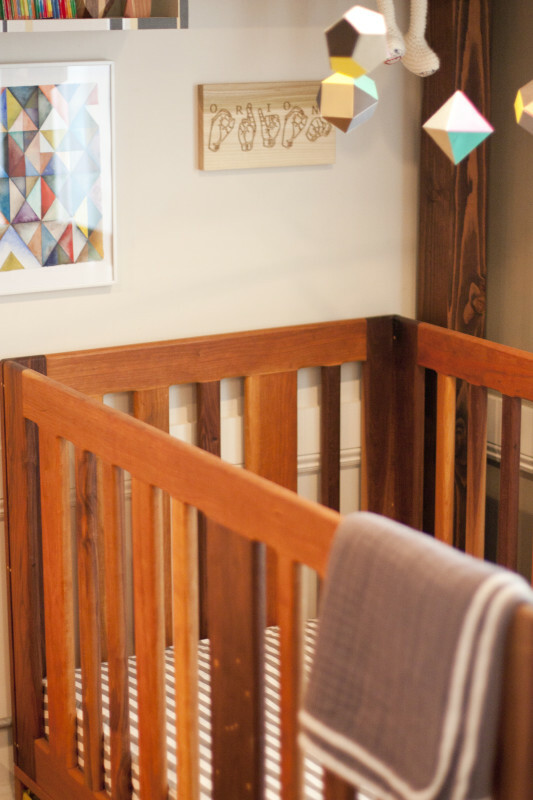 A look at the nursery, which sits under Erin and Danny's bed in their 507-square-feet Tenderloin apartment. "We did! There was pretty much only one spot available, unless we wanted to stash her in the bathroom. 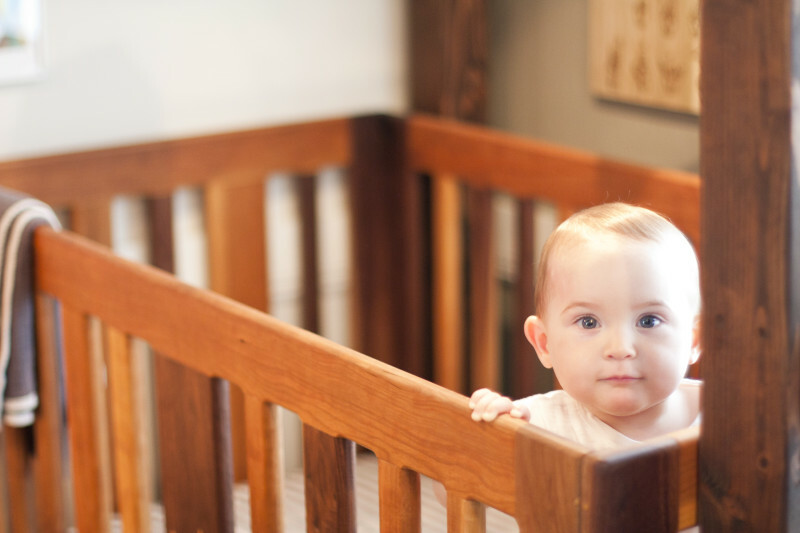 And once we measured, it turned out a standard crib mattress fit in that spot with a few inches to spare." 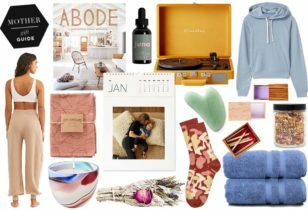 "Similar to the rest of the house: Modern, but with a sense of warmth and personality that is expressed through color, a mix of materials like wood, wallpaper, and textiles, and custom pieces that have meaning to us." 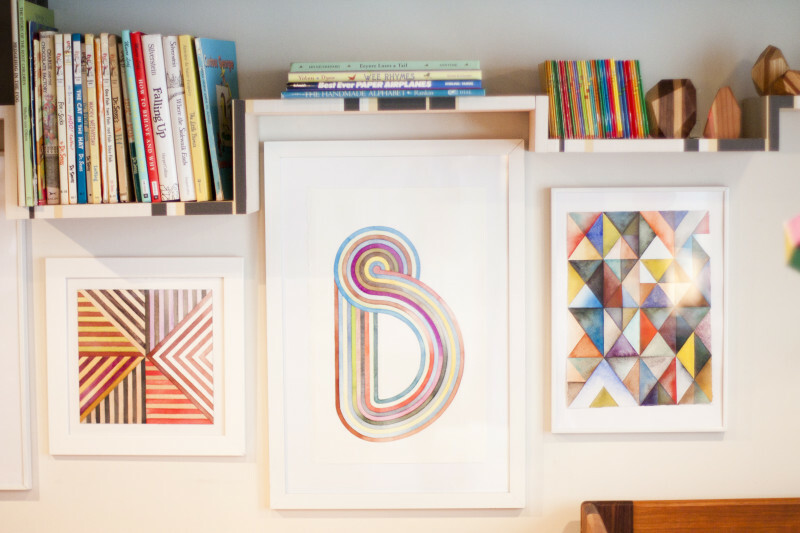 Colorful watercolors by Serena Mitnik-Miller, owner of the swoon-worthy General Store in S.F. and L.A.
"I love her crib and the storage beneath it. Of course, she has far too many clothes, but we actually still have space to spare in the bins underneath her bed. And I love the idea that she sleeps just below us. It feels like some kind of cozy family treehouse." Orion's gorgeous sign-language name tag was created by her father, Danny Montoya of Key & Kite. You can buy your own here. Her modern mobile can be found here. The pint-sized cutie in her room. "He basically made everything. When we first moved in, almost seven years ago, he built the loft, the dresser, closet, and the desk. 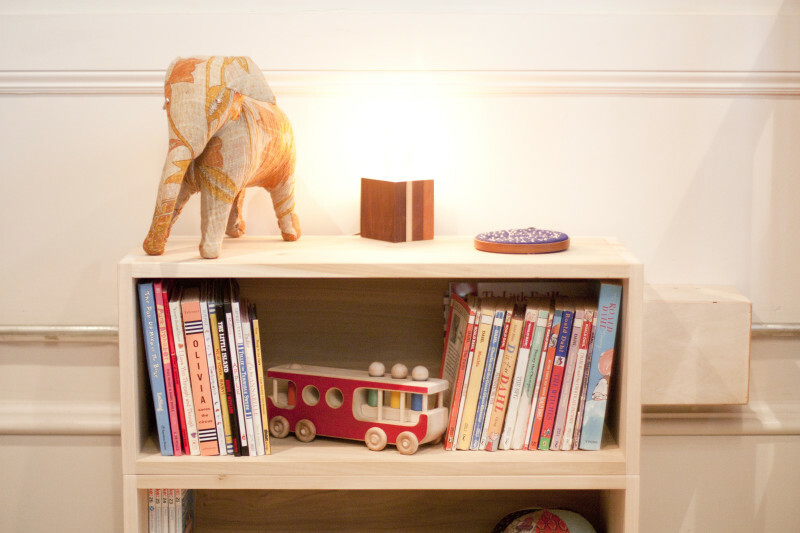 Once I was pregnant, he built the crib and the floating bookshelves. Well, he built the floating bookshelves while I was pregnant. Orion came five weeks early, the day after Danny bought all the materials for the crib. So, that came a little later. The bookshelves on the floor used to be underneath the mattress when she was tiny and it had to be raised. 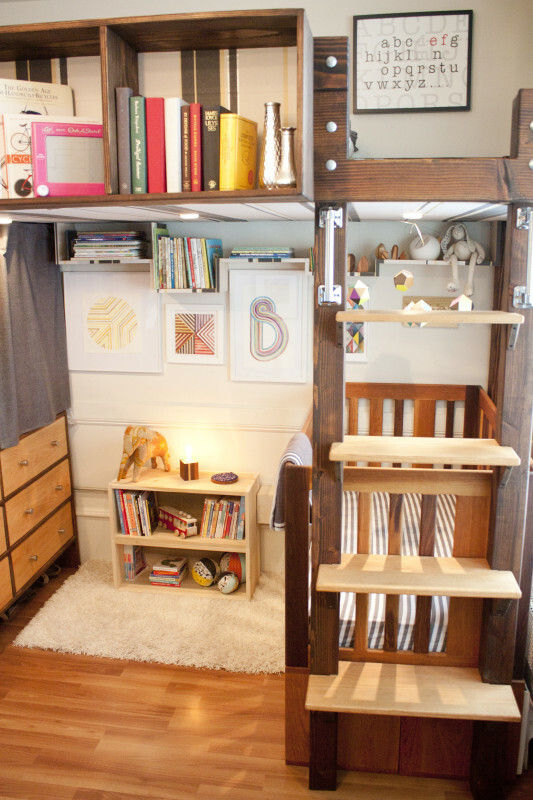 Then they came out and turned into her little toy and book nook." "He also made the American Sign Language artwork. 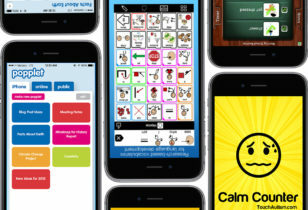 My mother is a sign language interpreter, and when Danny taught kindergarten he used sign language with his kids a lot, so it was important to both of us. 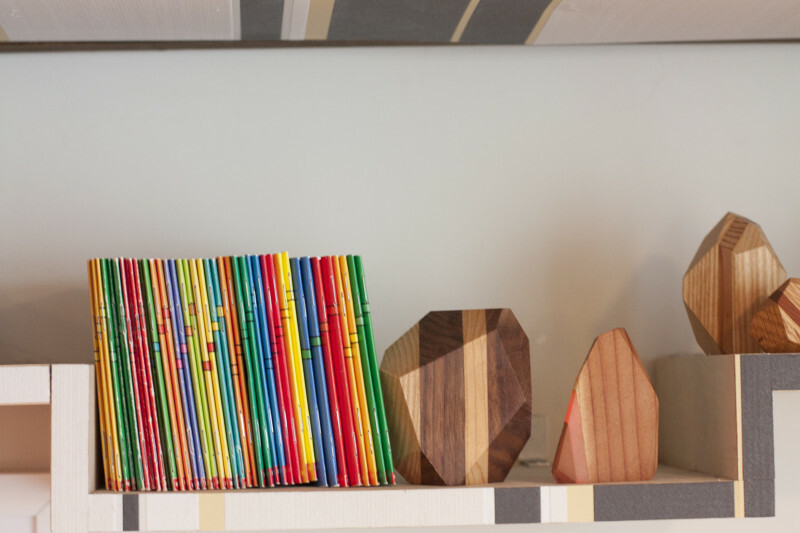 He just started offering those pieces, as well as an ASL-engraved toy box, on his Etsy shop." Orion's book nook, lit up by a Key & Kite small ambient wood lamp. "She loves her crib. When she wakes up, she can spend up to 30 minutes just playing in there. She also loves her mini shelves. 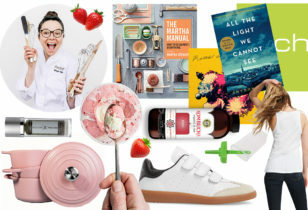 Currently, pulling all the books off the shelves one by one is a favorite activity." "It's all by Serena Mitnik-Miller. 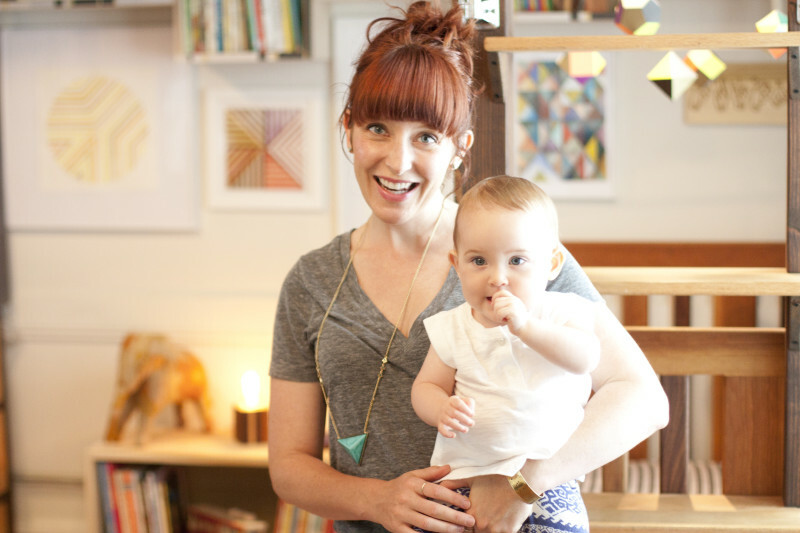 She is a good friend, talented artist, and owner of the General Store in S.F. and Venice." 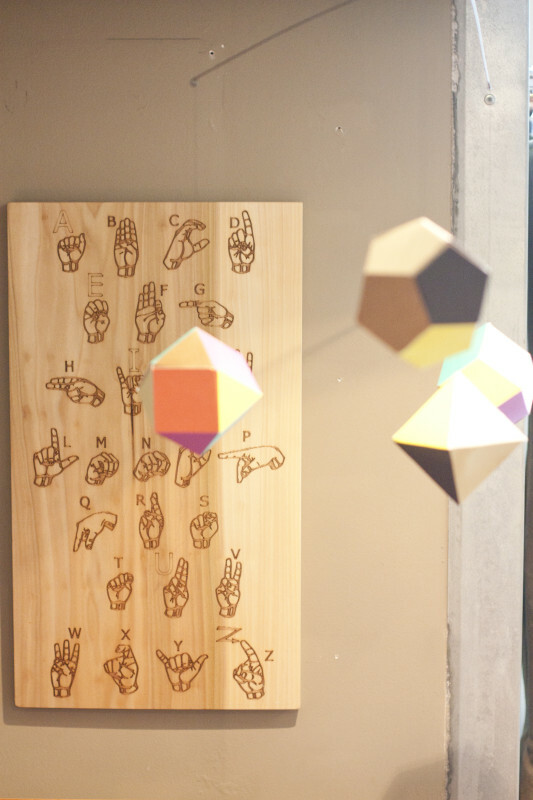 Danny's handmade, laser-etched sign-language chart can be found on his Etsy shop. 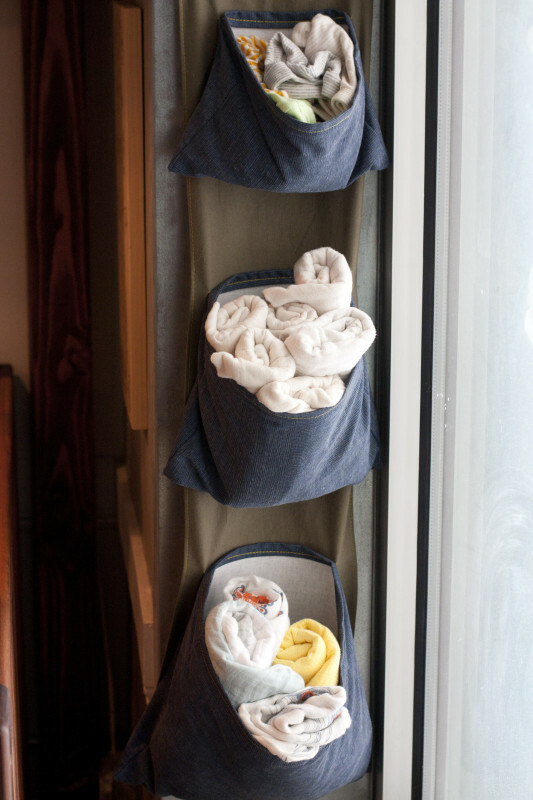 Extra storage for blankets and other accessories hangs just outside the "nursery."